Carube Copper Corp. (TSXV:CUC) is pleased to report positive results from its ongoing surface exploration program at the Company’s 100% owned Main Ridge Project (“MR”) in Jamaica. Assay results have been received from the recent soil and rock sampling over the eastern area of MR.
Carube Copper Corp. (TSXV:CUC) is pleased to report positive results from its ongoing surface exploration program at the Company’s 100% owned Main Ridge Project (“MR”) in Jamaica. 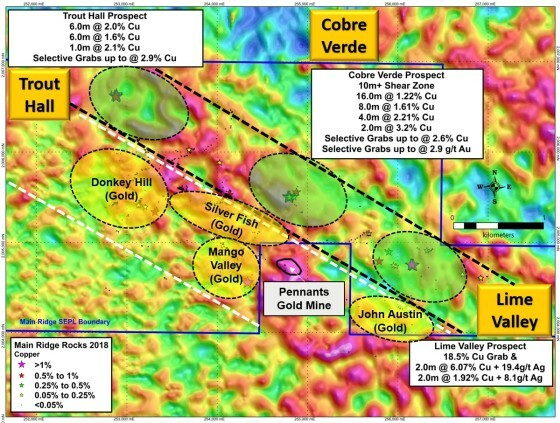 Assay results have been received from the recent soil and rock sampling over the eastern area of MR. Mapping and prospecting in conjunction with a grid-based soil sampling program and follow-up rock channel sampling has identified high grade copper-silver mineralization along the Rio Minho Valley (“RMV”), located immediately northeast of and parallel to the Bennett Gold Zone (“BGZ”). Mr. Stephen Hughes, CEO, commented: “The discovery of high-grade copper – silver mineralization along the RMV combined with widespread gold mineralization along the BGZ adds considerably to the potential of the MR project. Carube’s mapping and sampling program continues to identify mineralized structures and veins at MR, and this latest discovery confirms the area is highly prospective for polymetallic style mineralization. The team are currently trenching and sampling across outcropping epithermal style gold mineralization at Donkey Hill and will continue prospecting along the RMV in search of additional high-grade polymetallic veins / structures”. Grid soil sampling completed at Lime Valley and Trout Hall was carried out at 100 metre spacings over an area measuring 1500 meters by 1900 meters and 900 meters by 600 meters respectively, for a total 405 samples. Soil lines oriented in a north-south pattern due to the prominent northwest – southeast and northeast – southwest oriented structures that appear to control mineralization at MR. Assays were completed by ALS Canada Ltd, multi-element analysis done by 35-element aqua regia digestion with ICP-AES analysis using a 50-gram subsample, and gold was analyzed for by Fire Assay – Atomic Absorption using a 30-gram split. With respect to rock chip sampling, to date a total 505 samples have been collected and assayed from MR while additional channels and grabs are being collected from an ongoing trench program at Donkey Hill and continued prospecting along the RMV. The grab samples are selected samples and are not necessarily representative of the mineralization hosted along the RMV copper-silver trend. Strict QA/QC sampling procedures are followed including inserting lab certified standard reference material and “blank” limestone reference material every 25th and 26th sample, respectively. Samples are then prepared for shipment by Carube geologists and handed off to FedEx Jamaica with a chain of custody form and shipped directly to the ALS laboratory. Cobre Verde Prospect: A quartz-carbonate brecciated zone located approximately 700 meters north of the former Pennants mine. Chalcopyrite, bornite, azurite and malachite occur as disseminated grains, in quartz veins and coating fracture faces. The true width of this zone is unknown as channel sampling was conducted along a recent land slip. A total 8 samples were collected at 2-meter intervals, with assays ranging from 0.25% to 3.23% copper and 1.9g/t and 24.9g/t silver. A single grab sample from this structure assayed 2.64% copper and 16.4g/t silver. Lime Valley Prospect: A shallow dipping northwest-southeast striking breccia zone containing massive to fragmented chalcocite with secondary malachite and azurite staining. Two channels were completed, the first is 20 meters (2-meter sample intervals) in length and the second channel was collected across a 2-meter wide outcrop located 20 meters east. Assays from the 20-meter channel confirm the mineralized structure is two meters in width, which assayed 6.07% copper and 19.4g/t silver. The second 2-meter channel was collected from the same structure and assayed 1.92% copper and 8.1g/t silver. A single grab sample from this structure assayed 18.5% copper and 80.5g/t silver. 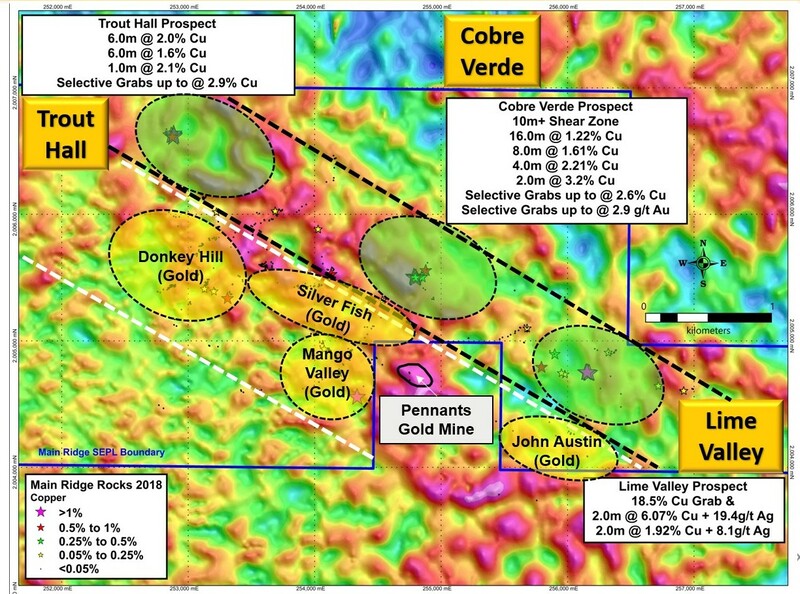 There is a discrete and strong copper in soil anomaly (below detection up to 0.11% copper) approximately 350 meters northwest of the Lime Valley mineralized breccia, which is along trend of the Cobre Verde prospect. Trout Hall Prospect: The copper in soil anomaly occurs at the intersection of two major structures, a major northwest – southeast fault and a late stage northeast – southwest cross-cutting structure. Individual soil sample assays range from below detection up to 0.38% copper. Three channels were completed, each 6-meters in length and sampled at 2-meter intervals. Assays range from 0.21% to 2.86% copper. Carube is encouraged by the recent discovery of three copper-silver prospects along the RMV, which have been defined within twelve weeks of commencement of the field activities at MR. Results to date continue to validate the company’s opinion that MR has significant base and precious metal mineralization with district-scale potential. The exploration team will continue mapping, sampling, and trenching, with focus on Donkey Hill and along the RMV. The company is continuing with a focussed and disciplined strategy of identifying and securing an additional high-quality copper, gold or polymetallic asset while seeking to farm out or divest non-core properties. The exploration team has completed over fifty property reviews in the last quarter and several projects have been advanced to the detailed technical review stage. Carube Copper is focused on creating substantive long-term value for its shareholders through the discovery and development of world class copper and gold deposits. Carube currently holds a 100% interest in 11 licenses covering 535 km2 of highly prospective copper-gold terrain in Jamaica, and a 100% interest in three porphyry copper-gold properties covering 492 km2within the Cascade Magmatic Arc in southwestern British Columbia. Carube is actively searching for additional high potential copper and gold properties to add to its portfolio. QP Statement: This press release has been reviewed and approved by Mr. Shannon Baird, P.Geo., Carube Copper’s Exploration Manager, in his capacity as a qualified person as defined under NI 43-101. This news release includes certain “forward-looking statements” which are not comprised of historical facts. Forward-looking statements are based on assumptions and address future events and conditions, and by their very nature involve inherent risks and uncertainties. Although these statements are based on currently available information, Carube Copper Corp. provides no assurance that actual results will meet management’s expectations. Factors which cause results to differ materially are set out in the Company’s documents filed on SEDAR. Undue reliance should not be placed on “forward looking statements”. Click here to connect with Carube Copper Corp. (TSXV:CUC) for an Investor Presentation.